According to Paul O'Shea, Hitler had a "blatant disregard" for the Concordat, and its signing was to him merely a first step in the "gradual suppression of the Catholic Church in Germany". Almost immediately after signing the Concordat, the Nazis promulgated their sterilization law—the Law for the Prevention of Hereditarily Diseased Offspring—an offensive policy in the eyes of the Catholic Church. Days later, moves began to dissolve the Catholic Youth League. Clergy, nuns and lay leaders began to be targeted, leading to thousands of arrests over the ensuing years, often on trumped up charges of currency smuggling or "immorality". Priests were watched closely and frequently denounced, arrested and sent to concentration camps. From 1940, a dedicated Clergy Barracks had been established at Dachau concentration camp. Intimidation of clergy was widespread. Cardinal Faulhaber was shot at. Cardinal Innitzer had his Vienna residence ransacked in October 1938 and Bishop Sproll of Rottenburg was jostled and his home vandalised. William Shirer wrote that the German people were not greatly aroused by the persecution of the churches by the Nazi Government. The great majority were not moved to face death or imprisonment for the sake of freedom of worship, being too impressed by Hitler's early foreign policy successes and the restoration of the German economy. Few, he said, paused to reflect that the Nazi regime intended to destroy Christianity in Germany, if it could, and substitute the old paganism of the early tribal Germanic gods and the new paganism of the Nazi extremists." After constant confrontations, by late 1935, Bishop  The Nazis responded with, an intensification of the Church Struggle, beginning around April. When the Nazi government violated the concordat (in particular Article 31), the bishops and the Papacy protested against these violations. Pius XI considered terminating the concordat, but his secretary of state and members of the curia, who feared the impact upon German Catholics, dissuaded him, as they believed it would result in the loss of a protective shield. Cardinal Pacelli acknowledged his role in its retention after the war. The flourishing Catholic press of Germany faced censorship and closure. Finally in March 1941, Goebbels banned all Church press, on the pretext of a "paper shortage". Catholic schools were a major battleground in the kirchenkampf campaign against the Church. When in 1933, the Nazi school superintendent of Munster issued a decree that religious instruction be combined with discussion of the "demoralising power" of the "people of Israel", Bishop August von Galen of Munich refused, writing that such interference in curriculum was a breach of the Concordat and that he feared children would be confused as to their "obligation to act with charity to all men" and as to the historical mission of the people of Israel. Often Galen directly protested to Hitler over violations of the Concordat. When in 1936, Nazis removed crucifixes in school, protest by Galen led to public demonstration. Church kindergartens were closed, crucifixes were removed from schools and Catholic welfare programs were restricted on the basis they assisted the "racially unfit". Parents were coerced into removing their children from Catholic schools. In Bavaria, teaching positions formerly allotted to nuns were awarded to secular teachers and denominational schools transformed into "Community schools". When in 1937 the authorities in Upper Bavaria attempted to replace Catholic schools with "common schools", Cardinal Faulhaber offered fierce resistance. By 1939 all Catholic denominational schools had been disbanded or converted to public facilities. From 1940, the Gestapo launched an intense persecution of the monasteries; invading, searching and appropriating them. The Provincial of the Dominican Province of Teutonia, Laurentius Siemer, a spiritual leader of the German Resistance was influential in the Committee for Matters Relating to the Orders, which formed in response to Nazi attacks against Catholic monasteries and aimed to encourage the bishops to intercede on behalf of the Orders and oppose the Nazi state more emphatically. With the expansion of the war in the East from 1941, there came also an expansion of the regime's attack on the churches. Monasteries and convents were targeted and expropriation of Church properties surged. The Nazi authorities claimed that the properties were needed for wartime necessities such as hospitals, or accommodation for refugees or children, but in fact used them for their own purposes. "Hostility to the state" was another common cause give for the confiscations, and the action of a single member of a monastery could result in seizure of the whole. The Jesuits were especially targeted. The Papal Nuncio Cesare Orsenigo and Cardinal Bertram complained constantly to the authorities but were told to expect more requisitions owing to war-time needs. Figures like Bishops August von Galen and Konrad von Preysing attempted to protect German priests from arrest. In Galen's famous 1941 anti-euthanasia sermons, he denounced the confiscations of church properties. He attacked the Gestapo for converting church properties to their own purposes—including use as cinemas and brothels. He protested the mistreatment of Catholics in Germany: the arrests and imprisonment without legal process, the suppression of the monasteries and the expulsion of religious orders. Pius XII put a high priority on preserving the Concordat from the Nazi era, although the bishops were unenthusiastic about it and the Allies considered the request inappropriate. After the war, the Concordat remained in place and the Church was restored to its previous position. When Lower Saxony adopted a new school law, the Holy See complained that it violated the terms of the concordat. The federal government called upon the Federal Constitutional Court of Germany (Bundesverfassungsgericht) for clarification. In its ruling on 26 March 1957, the court decided that the circumstances surrounding the conclusion of the concordat did not invalidate it. Declaring itself incompetent in matters of public international law and considering the fact that the Basic Law grants authority in school matters to the States of Germany, it ruled that the federal government had no authority to intervene. So while the federal government was obligated by the concordat, it could not enforce its application in all areas as it lacks legal authority to do so. Critics also allege that the concordat undermined the separation of church and state. The Weimar constitution (some of whose regulations, namely articles 136-139 and 141 have been included into today's Basic Law by article 140) does not speak of a "separation", but rather rules out any state religion while protecting religious freedom, religious holidays and leaving open the possibility of cooperation. However, there is an ongoing conflict between article 18 of the concordat and article 138 of the Weimar constitution. , 1937 (English translation)Mit brennender Sorge Pope Pius XI's encyclical Mit brennender Sorge. ^ Paul, Gregory (October–November 2003). "The Great Scandal: Christianity's Role in the Rise of the Nazis". ^ Falconi, p. 207; Lapide (p. 99) notes that on 30 April the leader of an interfaith group asked Cardinal Bertram to help against the boycott of Jewish businesses but was refused because it was purely an economic matter and that Jews had not spoken out when the Church was persecuted. ^ a b Martin Rhonheimer, "The Holocaust: What Was Not Said" First Things Magazine, November 2003. Retrieved 5 July 2009. ^ a b c d e Carroll, p. 505. ^ Hughes, John Jay (2007-05-18). "An Antidotal History". National Review. Retrieved 2013-08-29. ^ "Nazi Policy and the Catholic Church". Catholiceducation.org. Retrieved 2013-08-18. ^ "The German Churches and the Nazi State". United States Holocaust Memorial Museum. June 10, 2013. Retrieved 2013-08-18. ^ Karol Josef Gajewski. "Nazi Policy and the Catholic Church". Catholic Education Resource Centre. Retrieved 3 June 2015. ^ Encyclopedia Britannica Online: "Blessed Clemens August, Graf von Galen"; web Apr 2013. ^ The Nazi War Against the Catholic Church; National Catholic Welfare Conference; Washington D.C.; 1942; pp. 74–80. ^ a b "BVerfGE 6, 309 - Reichskonkordat" (in Deutsch). servat.unibe.ch. 1957-03-26. Retrieved 2013-11-23. ^ """The German principle of "church autonomy. concordatwatch.eu. Retrieved 2013-11-23. ^ Rhodes, p. 182; Rhodes quotes from an allocution given by Pius XII on 2 June 1945 which lends weight to this interpretation. ^ Cornwell, John. Review of Hitler's Priests: Catholic Clergy and National Socialism by Kevin P. Spicer in Church History: Studies in Christianity and Culture, Volume 78, Issue March 2009, pp 235–237. Published online by Cambridge University Press, 20 February 2009. The provocative agitation which for years was conducted against the NSDAP because of its alleged hostility to religion has now been refuted by the Church itself. This fact signifies a tremendous moral strengthening of the National Socialist government of the Reich and its reputation. Already it is being said that THE POPE OF ROME thinks of nobody save his own adherents and that he does not care how Lutherans are dragooned and how Jews are harried so long as Popish bishops, monastic orders, confessional schools, and Catholic associations are allowed full freedom. We beg our Protestant and Jewish friends to put away such suspicions. As we suggested at the outset of this brief article, the Catholic Church could have done little for other denominations in Germany if she had begun thrusting out wild hands to help them while her own feet were slipping under her. By patience and reasonableness she has succeeded in re-establishing herself, more firmly than before, on a Concordat which does not surrender one feather's weight of essential Catholic principle. She will straightway set about her sacred task, an important part of which will be the casting out of those devils which have been raging—and are raging still—in the Reich. But "this sort" of devil is not cast out save by prayer. Political action (from which the German clergy are debarred under the Concordat) by the Church would drive matters from bad to worse. We are confident, however, that Catholics will abhor the idea of enjoying complete toleration while Protestants and Jews are under the harrow, and that, quietly but strongly, the Catholic influence will be exerted in the right direction. One German out of three is a Catholic ; and Catholic prestige is high in Germany's public life. Additional protocol was added at its signing. When the concordat was ratified September 10, 1933 it granted Catholic clergy certain exemptions from any future universal army conscription call-ups. As Article 27 states, "A special and exempt ministry is conceded . . . ." As the Treaty of Versailles had forbidden Germany from raising a large army. This provision may have been seen by Hitler as the Vatican giving its tacit approval to German rearmament. Papen wrote to Hitler regarding this secret provision and concluded his brief with "I hope this agreement will therefore be pleasing to you". The provisions of the annexe were inserted at the request of the German Bishops Fulda Conference and the contents were kept so secret that Ernst von Weizsacker, State Secretary in the Foreign Ministry from 1938, did not know of it until informed by the Papal Nuncio Orsenigo in 1939. Article 33 makes provision for settling any difficulties in interpretation of the concordat through "amicable solution by mutual agreement. "Article 34 calls for the speedy ratification of the concordat. As the document states It was not in force until its ratification September 10, 1933. Article 34 This Concordat, whose German and Italian texts shall have equal binding force, shall be ratified and the certificates of ratification shall be exchanged as soon as possible. It will be enforced from the day of exchange. In witness hereof the plenipotentiaries [representatives] have signed this Concordat. Signed in the two original exemplars, in the Vatican City, July 30, 1933. Signed: Eugenio, Cardinal Pacelli. Signed: Franz von Papen. Articles 31–32 relate to the issue of Catholic organizations "devoted exclusively to religious, cultural and charitable purposes" and empowered the Reich government and German episcopate to "determine, by mutual agreement, the organizations and associations which fall within the provisions of this article." Organizations [sponsored by the Catholic Church] that had any political aims no longer had any place in the new Germany; this went without saying and not even mentioned. Article 32 gave to Hitler one of his principal objectives: the exclusion of the clergy from politics such that "the Holy See will issue ordinances by which the clergy and the religious will be forbidden to be members of political parties or to be active on their behalf." Catholic laity, however, were free to form, engage and propagate political parties and seek political office. The Additional Protocol provisions make clear this prohibition of clergy from political activism does not mean they can not preach on moral teachings and principles of the Church "as it is their duty to do." Article 28 assured the Church the right to pastoral care in hospitals, prisons and like institutions, which would be violated later by the Nazi regime when it refused the Church's request to carry out services in concentration camps. Article 27 regulated the appointment of military chaplains. Article 26 allowed that a church wedding could precede a civil marriage ceremony. Articles 19–25 gave protection to the Catholic educational system (Hitler in due course would disregard them). Article 18 assured the Church that it would be consulted should the Nazi regime [or existing government] try to discontinue its subsidies to the German Catholic church. or other legal title without compensation as specified in Article 138 of the Weimar Constitution for all religious organizations. Article 18 Should the state payments in kind or money, which are made to the Catholic Church, wether based on law, contract, or any other special legal title, be discontinued, the Holy See and the Reich will proceed in due time beforehand to set up amicable agreement the principles according to which the discontinuation is to be carried out. In this connection, a right derived from a legitimate traditional custom is to be considered as a special legal title. Such discontinuation, implying the cessation of a state payment or obligation, must be adequately compensated in favor of the claimant. Article 17 guaranteed, according to the common law, the properties of the church. Article 16 specified Bishops must take an oath of loyalty and respect to either the Reich governor of the state concerned or to the President of the Reich. as established by the constitution. When the treaty was signed and ratified the word Reich, or the phrase, German Reich, is not in reference to the Third Reich, but rather, as it applies to the period of the Weimar Republic which did not officially and fully collapse until the death of President Paul von Hindenburg August 2, 1934 with the passing of a national referendum vote August 19, 1934 consolidating the Office of Chancellor and President, thereby, declaring Adolf Hitler Führer of Germany. Article 16 Before taking possession of their diocese, the bishops shall take an oath of loyalty either between the hands of the Reichsstatthalter in the state (Land) in question or between those of the president of the Reich, the formula of which shall be the following: "Before God and on the Holy Gospel I swear and promise, as becomes a bishop, loyalty to the German Reich and to the Land of [name of Land] I swear and promise to respect the government established according to the constitution and to cause the clergy of my diocese to respect it. In the due solicitude for the welfare and the interests of the German Reich, I will endeavor, while performing the spiritual office bestowed upon me, to prevent anything which might threaten to be detrimental to it." Article 15 guaranteed religious orders freedom for pastoral, charitable and educational work. Article 15 Religious orders and congregations are not subject, on the part of the state, to any particular restrictions as far as their foundation, their various establishments, the number of their members and their qualifications (save, however, for the previsions of art. 15 par. 2), their pastoral or educational activity, their care of the sick and charitable work, the management of their affairs and the administration of their property are concerned. Superiors of religious orders who have their official residence, within the German Reich must have German citizenship. Provincials and superiors whose official residence is situated outside the German territory have the right of visitation of their establishments in Germany, even if they have a foreign citizenship. The Holy See will see to it that the organization of the provinces of various religious orders, as regards their establishments in Germany, should be such as to avoid - so far as it can be done - the subordination of German establishments to foreign provincials. Exceptions therefrom may be admitted by mutual agreement with the Reich government, particularly in cases where the small number of establishments in Germany makes the formation of German province impracticable or where special reasons exist for the maintenance of a provincial organization rooted in history and working well in practice. Article 14 specified appointments of a bishop by the Pope was subject to mutual agreement and communication with the regime that no [general] political impediment existed. while affirming appointments are free to made without any co-operation on the part of the state or civil corporations. Article 13 gave to parishes, Episcopal sees, religious orders etc. juridical personality and granted the same rights as any other publicly recognised body "in accordance with the general law as applicable to all" which subjected the church's prerogatives' to legal regulation under civil law. Guenter Lewy viewed this qualification as establishing "a pandora's box of troubles" when the law was effectively in the hands of a regime who wanted to control the church. Articles 11–12 specified that diocesan boundaries had to be made subject to government approval and that ecclesiastical offices could be established if no state funding was involved. Article 12 Without prejudice to the provisions of Article 11, ecclesiastical offices can be freely established and altered if no subsidy is asked for from the state funds. The co-operation of the state in establishing and changing the parish communities shall proceed according to the rules which have been arranged with the diocesan bishops; the Reich government will endeavor to achieve a uniform formulation by the state governments of their rules as far as possible. Article 11 The present organization and delimitation [boundaries] of the Roman Catholic dioceses in the German Reich remains at it is. If, however, the rearrangement of a bishopric or of an ecclesiastical province, or any other changes in the delimitation of diocese appear necessary in the future, they will be subject to agreement with the government of the state concerned in case that they involve changes only with boundaries of one German state (Land). 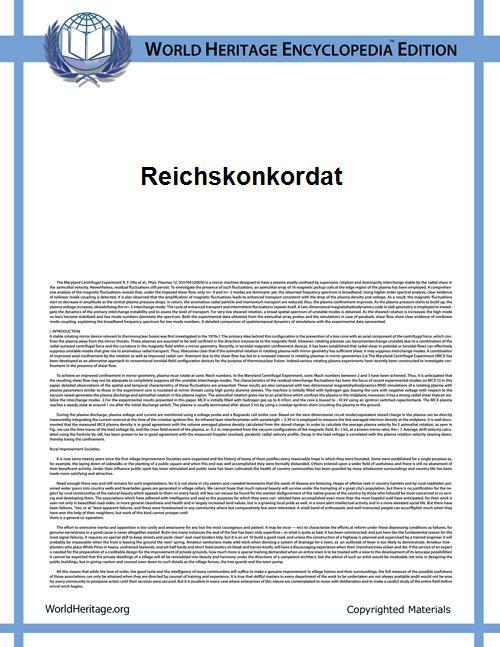 In case of rearrangement of changes which exceed the boundaries of one German state, the agreement is to be made with the Reich government, to whose care it shall be left secure the consent of the state governments in question. The same applies to the establishment of new ecclesiastical provinces or alterations therein if these involve several German states. The foregoing provisions are not applicable to he shifting of boundaries which is made only with regard to the local care of souls. In case of a wider reorganization within the German reich, the Reich government shall consult with the Holy See with a view to such regrouping of dioceses and to their delimitation. Articles 5–10 dealt with the status of the clergy under German law. Priests were given protection against any interference in their spiritual activities as well as protection against malicious slander or misuse of clerical dress. Exemption from jury service, and like obligations, was guaranteed and the secrecy of the confessional guaranteed. Members of the clergy could only accept a state appointment so long as the bishop approved and this permission could be withdrawn at any time for important reasons. Article 10 The wearing of clerical dress or of a religious habit by lay persons or by clerics or religious who have been forbidden to wear it on the strength of a final and valid decision of the competent Church authority - officially communicated to the state authorities - shall be punished by the state with the same penalties as the misuse of a military uniform. Article 9 The judicial and other authorities cannot ask the clergy to give information about matters which have been entrusted to them while exercising the care of souls and which are consequently covered by the obligation of pastoral secrecy. Article 8 The official income of the clergy is exempt from distraint to the same extent as the official salary of the civil servants of the Reich and of the states. Article 7 A member of the clergy can accept an official function or appointment in the state or in any publicly constituted corporation dependent on the state only after having received the Nihil obstat of his diocesan ordinary [bishop], as well as that of the ordinary competent for the place where the seat of the corporation is situated. For important reasons in which the interests of the Church are involved, the nihil obstat can be withdrawn at any time. Article 6 Clerics and religious are exempt from the obligation to undertake public offices and such obligations as are incompatible with their clerical or religious status. This applies particularly to the office of magistrate, member of a jury in law courts, membership of taxation committees or membership of the fiscal tribunal. Article 5 The clergy enjoy in the discharge of their spiritual activities the same protection of the state as state officials. The state will proceed according to general provisions of its law in case of any outrage directed against any clergy personally or against their ecclesiastical character or in case of any interference with duties of their office and, if necessary, will provide official protection. Article 4 assures the Holy See of full freedom to communicate with the German clergy and for the German bishops to communicate with the laity "in all matters of their pastoral office." The words of qualification in this clause would later be interpreted by the Nazis in its most narrow meaning to limit the Church communications to worship and ritual only. Article 4 The Holy See shall enjoy full freedom in its contact and correspondence with the bishops, clergy and all other members of the Catholic Church in Germany. The same applies to the bishops and other diocesan authorities in their contact with the faithful in all matters of their pastoral office. Instructions, ordinances, pastoral letters, official diocesan gazettes and other enactments concerning the spiritual guidance of the faithful, issued by the ecclesiastical authorities within the framework of their competence, may be published without hindrance and made known to the faithful in the ways heretofore usual. Confirms the Vatican having a Papal Nuncio [diplomat) in Berlin and the German government having an ambassador in Rome. Affirms the state concordats, Länderkonkordate, with Bavaria (1924), Prussia (1929), and Baden (1932) remain valid. Article 2 The concordats concluded with Bavaria (1924), Prussia (1929) and Baden (1932) and the rights and privileges of the Catholic Church recognized therein remain unchanged within the territory of the States (Laender) concerned. For the rest of the states provisions of the present concordat shall be fully applicable. These provisions shall also be binding for the said three states in so far as they are relative to matters not regulated by the concordats concluded with those states, or in so far as they complete the arrangements already made. The vagueness of the article would later lead to contradictory interpretations. Article 1 The German Reich guarantees freedom of profession and public practice of the Catholic religion. It recognizes the right of the Catholic Church to regulate and manage her own affairs independently within the limits of the law applicable to all and to issue - within the framework of her own competence - laws and ordinances binding on her members. His Holiness Pope Pius XI has appointed as his plenipotentiary [a diplomat granted full power to represent] His Eminence the Most Revered Cardinal Eugenio Pacelli, His Holiness' Secretary of State; and the President of the German Reich [Paul von Hindenburg] has appointed as plenipotentiary the Vice-Chairman of the German Reich, Herr Franz von Papen; who, having exchanged their proper form have agreed to the following articles. His Holliness Pope Pius XI and the President of the German Reich [Paul von Hindenburg], led by their common desire to consolidate and enhance the existing friendly relations between the Catholic Church and the state in the whole territory of the German Reich in a stable and satisfactory manner for both parties, have decided to conclude a solemn agreement which will supplement the concordats already concluded with some particular German States (Laender) and secure for the others the principles of a uniform treatment of the questions involved. The Treaty with Additional Protocol [in brackets] was signed July 20, 1933. It was ratified and in force starting September 10, 1933 and remains in force today. The text of the Concordat was released 22 July 1933 and began with a preamble that set out the common desire of both parties for friendly relations set-out in a solemn agreement. exchanged the handshake of trust with you through the concordat—the first foreign sovereign to do so. ... Pope Pius spoke high praise of you. ... Millions in foreign countries, Catholics and non-Catholics alike, have overcome their original mistrust because of this expression of papal trust, and have placed their trust in your regime." Church leaders were realistic about the Concordat's supposed protections. Cardinal Faulhaber is reported to have said "With the concordat we are hanged, without the concordat we are hanged, drawn and quartered." 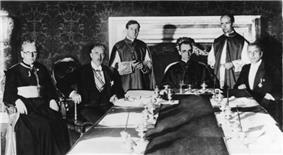 After the signing of the Concordat the Papal nuncio exhorted the German bishops to support Hitler's regime. The bishops told their flocks to try and get along with the Nazi regime. According to Michael Phayer it was the Concordat which prevented Pius XI from speaking out against the Nazi Nuremberg Laws in 1935, and though he did intend to speak out after the national pogrom of 1938 he was dissuaded by Cardinal Pacelli. Meanwhile, although the Protestant Churches, being local congregations, remained unaffected by restriction on foreign support, Hitler's government negotiated other agreements with them which in essence put Nazi officials, most of whom were Catholics, into positions of influence or outright authority over Protestant Churches. Foreseeing the potential for outright State control of their churches these agreements portended, many Protestant church leaders simply reorganized their congregations out of the agreements, causing a schism within the Protestant Churches. These Protestant resisters attempted to rally Catholic prelates to the dangers portended by these agreements but were simply rebuffed when the Reichskonkordat was ratified. Many of the Protestant clergy who opposed the Nazi religious program (Bekennende Kirche), were later imprisoned or executed. The Concordat was ratified on 10 September 1933 and Cardinal Pacelli took the opportunity to send a note to the Germans raising the social and economic condition of Jews who had converted to Catholicism but not Jews in general. On 4 August 1933 the British Minister reported "in conversations I have had with Cardinal Pacelli and Monsignor Pizzardo, neither gave me the feeling of the slightest regret at the eclipse of the Centre [Party], and its consequent loss of influence in German politics." On 19 August Kirkpatrick had a further discussion with Cardinal Pacelli in which he expressed his "disgust and abhorrence" at Hitler's reign of terror to the diplomat. Pacelli said "I had to choose between an agreement on their lines and the virtual elimination of the Catholic Church in the Reich". Pacelli also told Kirkpatrick that he deplored the persecution of the Jews, but a pistol had been held to his head and that he had no alternative, being given only one week to decide. Pinchas Lapide notes that whilst negotiations for Concordat were taking place, pressure had been put on the Vatican by the arrest of ninety-two priests, the searching of Catholic youth club premises, and the closing down of nine Catholic publications. The Nazi newspaper Völkischer Beobachter wrote "By her signature the Catholic Church has recognised National Socialism in the most solemn manner. ... This fact constitutes an enormous moral strengthening of our government and its prestige." On 24 July Cardinal Faulhaber sent a handwritten letter to Hitler, noting that "For Germany's prestige in the East and the West and before the whole world, this handshake with the papacy, the greatest moral power in the history of the world, is a feat of immeasurable importance." On 23 July a British Minister met Cardinal Pacelli who appeared "very satisfied" with the signing of the Concordat. The cardinal expressed the view that with the guarantees given relating to catholic education that this Concordat was an improvement over the 1929 agreement with Prussia. Cardinal Pacelli did sound a note of caution in that his satisfaction was based on the assumption that the German Government "remained true to its undertaking." but noted also that Hitler "was becoming increasingly moderate." What the liturgical movement is to the religious realm, fascism is to the political realm. The German stands and acts under authority, under leadership—whoever does not follow endangers society. Let us say 'yes' wholeheartedly to the new form of the total State, which is analogous throughout to the incarnation of the Church. The Church stands in the world as Germany stands in politics today. At the 14 July cabinet meeting Hitler brushed aside any debate on the details of the Concordat, expressing the view “that one should only consider it as a great achievement. The concordat gave Germany an opportunity and created an area of trust which was particularly significant in the developing struggle against international Jewry”. Saul Friedländer speculates that Hitler may have countenanced in this "area of trust" what he perceived as the Christian Church's traditional theological antipathy towards Jews, (see Hitler's comments above to Berning on 26 April), converging with Nazi aims. Hitler "underlined the triumph" that the Concordat meant for the Nazi regime. Only a short time earlier he had expressed doubts that "the church would be ready to commit the Bishops to this state. That this has happened, was without doubt an unreserved recognition of the present regime." On 13 July a British Minister had an interview with Cardinal Pacelli and reported, "His Eminence said that the Vatican really viewed with indifference the dissolution of the Centre Party." The issue of the concordat prolonged Kaas's stay in Rome, leaving the party without a chairman, and on 5 May Kaas finally resigned from his post. The party now elected Heinrich Brüning as chairman. At that time, the Centre party was subject to increasing pressure in the wake of the process of Gleichschaltung and after all the other parties had dissolved (or were banned, like the SPD). The Centre Party dissolved itself on 5 July 1933 as the Concordat between the Vatican and the Nazis had dealt it a decisive blow by exchanging a ban on the political activities of priests for the continuation of Catholic education. The Concordat was initialled in Rome three days later by Cardinal Pacelli and von Papen, with signing taking place on 20 July. On 2 July the Vatican daily newspaper L'Osservatore Romano insisted that the concordat wasn't an endorsement of Nazi teachings. Edith Stein wrote to Pius XI in April 1933 asking if he would issue an anti-anti-Semitism encyclical in view of "the indifference of Catholics to the growing vexations against the Jews." Pinchas Lapide thought that this wasn't actioned as the letter arrived when the Concordat negotiations were taking place. Edith Stein was later gassed in Auschwitz. The notes of the meeting do not record any response by Bishop Berning. In the opinion of Martin Rhonheimer, who cites the above transcript, "This is hardly surprising: for a Catholic Bishop in 1933 there was really nothing terribly objectionable in this historically correct reminder. And on this occasion, as always, Hitler was concealing his true intentions." Saul Friedländer interpreted Hitler's comments as an attempt to "blunt possible Catholic criticism of his anti-Jewish policies and to shift the burden of the arguments onto the Church itself. On 22 April 1933 the British Minister to the Vatican recounted what the Vatican Under-Secretary of State had told him, "The Holy See is not interested in the Centre Party. We are more concerned with the mass of Catholic voters in Germany than in the Catholic deputies who represent them in the Reichstag." Previously, as part of the agreement surrounding the 1929 Lateran Treaty with the fascist's in Italy, the Vatican had consented to the dissolution of the Catholic political Parito Popolare party. Cardinal Michael von Faulhaber wrote to Cardinal Pacelli on 10 April 1933 advising that defending the Jews would be wrong "because that would transform the attack on the Jews into an attack on the Church; and because the Jews are able to look after themselves"—the latter on the impression of the April boycott outcome which was seen as a Nazi defeat. Early in March 1933 the bishops recommended that Catholics vote for the Centre Party in the elections scheduled for 5 March 1933. However, two weeks later there was a reversal of previous policy and the bishops now allowed the Centre Party and the Bavarian Catholic Party to vote for the  At a cabinet meeting on 20 March 1933, Hitler "confidently reported" that the Centre Party had now seen the necessity of the Enabling Act and that "the acceptance of the Enabling Act also by the Zentrum would signify a strengthening prestige with regard to foreign countries." After my recent experience in Rome in the highest circles, which I cannot reveal here, I must say that I found, despite everything, a greater tolerance with regard to the new government. ... Let us meditate on the words of the Holy Father, who in a consistory, without mentioning his name, indicated before the whole world in Adolf Hitler the statesmen who first, after the Pope himself, has raised his voice against Bolshevism. Robert Ventresca wrote that because of increasing harassment of Catholics and Catholic clergy, Cardinal Pacelli sought a quick ratification of a treaty with the government, seeking in this way to protect the German Church. When Vice-Chancellor Papen and Ambassador Diego von Bergen met Pacelli in late June 1933 they found him "visibly influenced" by reports of actions being taken against German Catholic interests. [Hitler's] Dictatorship is a usurpation and his enforcement of it is a brutality. While we write these lines, with news of more arrests and repressions coming to us every hour, we remember that we have reached the Ides of March and the anniversary of a neverforgotten assassination. But Nazism's daggers cannot slay what is noblest and best in Germany. The Church, now that the Centre is no longer the key-group in German politics, may be persecuted ; but HITLER will not succeed where BISMARCK failed. We should trap the priests by their notorious greed and self-indulgence. We shall thus be able to settle everything with them in perfect peace and harmony. I shall give them a few years reprieve. Why should we quarrel ? They will swallow anything in order to keep their material advantages. Matters will never come to a head. They will recognise a firm will, and we need only show them once or twice who is the master. They will know which way the wind blows. Discussions between the two parties took place between 1931 and 1932 and at one point representatives of the Reich pointed out that Italy had an army Archbishop with Cardinal Pacelli indicating that was because Italy had signed a comprehensive concordat with the Vatican. The German negotiators continued to discuss solely on the basis of particular points rather than a general concordat during 1931 but even these were felt to be unlikely to be passed by the Reichstag or the Reichsrat, no matter their political or theological leanings. In October 1929, General Groener pushed the German Foreign Ministry to resolve an issue with the Vatican regarding military chaplains who lacked the ability to administer the sacraments of baptism or matrimony without first obtaining the permission of the local priest or bishop. Groener wanted the military to have their own bishop rather than rely on local ordinaries and it was this particular issue that was to mark an important step in the discussions that would ultimately be realized in the concordat with the Vatican. In March 1930, the new Papal Secretary of State, Cardinal Pacelli, gave indications that the Vatican would be interested in a concordat with the Reich in the event of any reforms of the Reich's constitution having an adverse effect on the validity of the concordats already agreed between the German states and the Vatican. In 1929, Pius signed the Lateran Treaty and a concordat with Italy, confirming the existence of an independent Vatican City state, in return for recognition of the Kingdom of Italy and an undertaking for the papacy to be neutral in world conflicts. In Article 24 of the Concordat, the papacy undertook "to remain outside temporal conflicts unless the parties concerned jointly appealed for the pacifying mission of the Holy See". Other major concordats included those signed with Germany (1933), Austria (1935), Yugoslavia (1935) and Latvia (1938). The concordats were generally observed by the countries involved, with the exception of Germany. Pius XI was elected Pope in 1922. His pontificate coincided with the early aftermath of the First World War. The old European monarchies had been largely swept away and a new and precarious order formed across the continent. In the East, the Soviet Union arose. In Italy, the Fascist dictator Benito Mussolini took power, while in Germany, the fragile Weimar Republic collapsed with the Nazi seizure of power. Pope Pius's major diplomatic approach was to make concordats. However, wrote Hebblethwaite, these concordats did not prove "durable or creditable" and "wholly failed in their aim of safeguarding the institutional rights of the Church" for "Europe was entering a period in which such agreements were regarded as mere scraps of paper". Negotiations relating to specific points, rather than a general concordat, took place between 1919 and 1922. But even after subsequent feelers were put out between the two parties the negotiations failed, primarily because both the Reichstag and Reichsrat were dominated by non-Catholic majorities who, for a variety of reasons, did not want a formal pact with the Vatican. In the absence of an agreement relating to particular areas of concern with the Reich, the Holy See concluded more wide-ranging concordats with three German states where Catholics were concentrated: Bavaria (1924), Prussia (1929) and Baden (1932). A formal realignment of Church and state relationships was considered desirable in the aftermath of the political instability of 1918 and the adoption of the Weimar constitution for the Reich along with the new constitutions in the German states in 1919. Key issues that the Church hoped to resolve related to state subsidies to the Church, support for Catholic schools, the appointment of bishops and the legal position of the clergy. The Reich government, in turn, wished for reasons of foreign policy to have friendly relations with the Holy See. Also, Germany wanted to prevent new diocesan boundaries being established which would dilute Germany's ties to ceded German territories in the east such as Danzig and Upper Silesia. Accounts of 20th century diplomatic relations between Germany and the Vatican commonly take as their starting point the political scene in the late 19th century. German Chancellor Bismarck's Kulturkampf ("Battle for Culture") of 1871–78 saw an attempt to assert a Protestant vision of nationalism over the new German Empire, and fused anticlericalism with suspicion of the Catholic population, whose loyalty was presumed to lie with Austria and France. The Catholic Centre Party had formed in 1870, initially to represent the religious interests of Catholics and Protestants, but was transformed by the Kulturkampf into the "political voice of Catholics". Bismarck's Culture Struggle was largely a failure. Otto von Bismarck became Chancellor of Germany in 1871 and launched the Kulturkampf Culture Struggle against the Roman Catholic Church in Germany. The Reichskonkordat between Germany and the Holy See was signed on July 20, 1933 and ratified in September of that year. The treaty was an extension of existing concordats already signed with Prussia and Bavaria A "concordat" is the equivalent of a treaty when the agreement is between the Catholic Church and a state. "Treaty" is a general term applied to any agreement between subjects of international law. Concordats have been used to create binding agreements to safeguard church interests and its freedom to act, particularly in countries that do not have strong jurisprudence guaranteeing government non-interference in religious matters or in countries where the church seeks a privileged position under government patronage. The treaty places constraints on the political activity of German clergy of the Catholic Church. This contributed to a decrease in the previously vocal criticism of Nazism by the hierarchy of the Catholic Church in Germany, after September 1933 when the treaty was ratified. From a Roman Catholic church perspective it has been argued that the concordat prevented even greater evils being unleashed against the Church, although critics like Gregory Paul call it a "classic political kickback scheme". Though some German bishops were unenthusiastic, and the Allies at the end of World War II felt it inappropriate, Pope Pius XII successfully argued to keep the concordat in force. It is still in force to this day. The Reichskonkordat is the most controversial of several concordats between Germany and other nations that the Vatican negotiated during the pontificate of Pius XI. It is frequently discussed in works that deal with the rise of Hitler in the early 1930s and the Holocaust. The concordat has been described by some as giving moral legitimacy to the Nazi regime soon after Hitler had acquired quasi-dictatorial powers through the Enabling Act of 1933, though Reichskanzler Hitler himself is not a signatory to the treaty and the treaty does not make mention of Hitler, or the Nazi Party. The source document is addressed to the democratically elected President and Commander and Chief of the military Paul Von Hindenburg.